Hide your alfalfa…This recipe might make all other sprouts jealous. I got the method for this recipe from Mark Bittman’s How To Cook Everything Vegetarian. A few changes: he calls for balsamic vinegar, which I omitted. Also, I added the pine nuts and parmesan, and sliced the garlic (he suggested leaving the garlic cloves whole). Preheat the oven to 450 degrees. Trim the hard edge of the stem from the Brussels sprouts, then cut each in half through its axis. Put the oil in a large ovenproof skillet over medium-high heat. When it shimmers, arrange the sprouts in one layer, cut side down. Toss in the garlic and sprinkle with salt and pepper. While the sprouts of cooking, heat a small skillet over medium-low heat. Toast the pine nuts in the dry skillet for a few minutes, shaking frequently to avoid burning. Remove from heat once the pine nuts are lightly browned and fragrant. 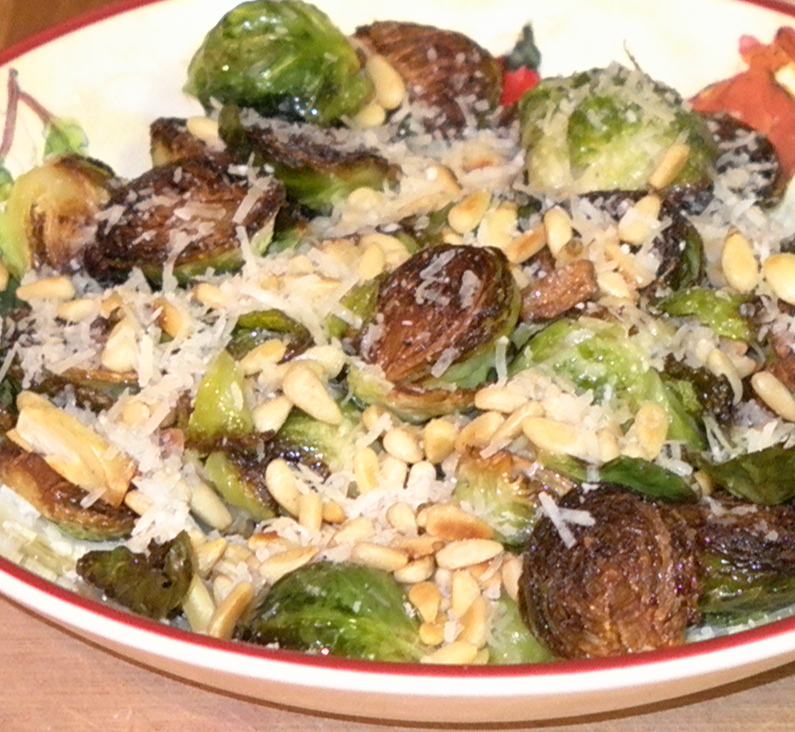 Put the sprouts mixture in a serving dish, and sprinkle with the pine nuts and cheese. Serve hot or warm.